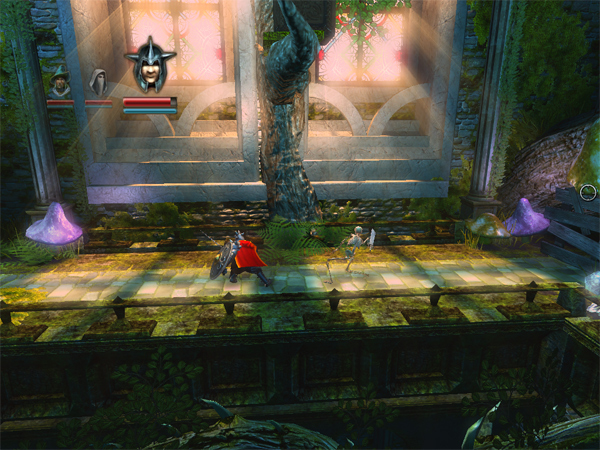 Trine is a side scrolling third person game, which reminds me in some ways to the old Ghosts and Goblins. 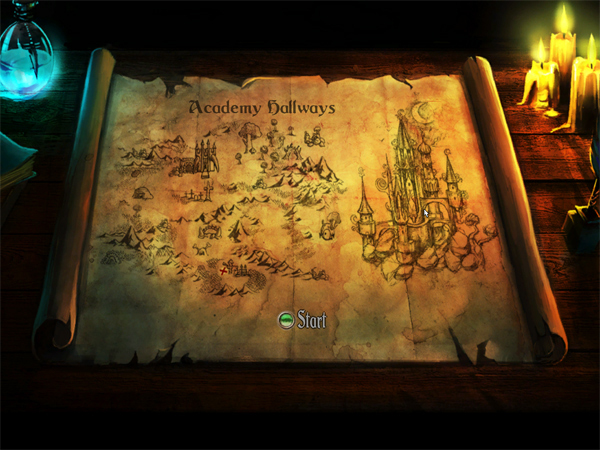 An addictive side scroller , with the best mix of sword and sorcery, dungeon delving, and fantasy adventure all in one. 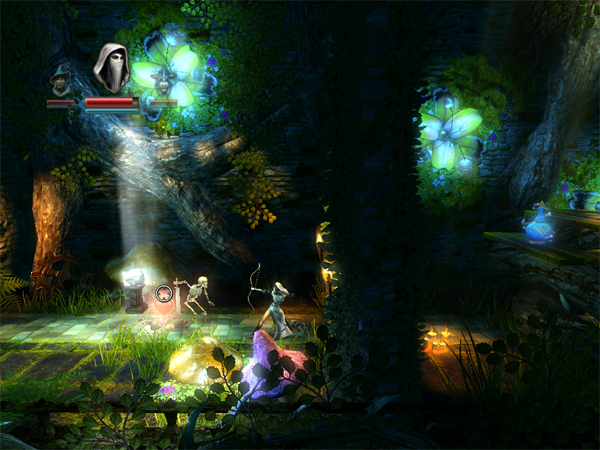 Through out the game the player takes control of one of three different interchangeable characters. A Thief, a Wizard and a Knight, whom all have different skills amongst them, the better to get past obstacles in this adventure. These character are introduced rather quickly in the beginning with a simple introduction and not much in the line of deep story telling, but the type of story telling that is reminiscent of the tried, true and well loved, once upon a time.....the characters are joined together by a mystical item known as the Trine. Thusly joined they must adventure together, though only one character can be activated at a time. Deciding which characters skills are needed is the key to success in this game. Will it be the Wizard? Who has the ability to levitate objects and also create objects... or will it be the thief who has a handy bow and arrows. And also a grappling line. Or The Knight, who is armored, has a shield that can be moved to either side of himself or over head to block falling rocks, and who also has a mighty weapon to smite enemies. Most of the puzzles and battles are straight forward affairs, but fun and addictive. The path forward past such obstacles is either via jumping, smashing levitating objects or using the grapple hook. 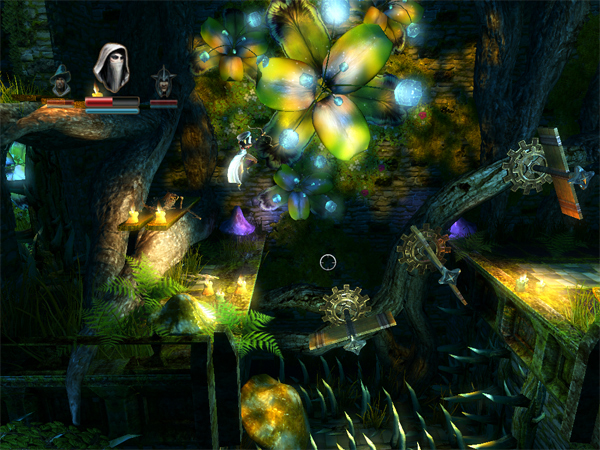 With creatures, traps and various obstacle puzzles to get past. The fun part of course is finding treasure and various vials and potions. Sometimes the vials and objects are just out of reach, so finding the way to get to them and collecting the reward is part of the fun. Some of the levels are pretty good in size which makes having to restart some of them a minor annoyance, but harkens back to ye olden days of coin op games when you lost the level and had to pump in another quarter to continue from the level you left off on. If a character is killed the player is left for a time, with the other two characters to try to move forth. After a time or finding the appropriate potion brings the lost character back, which makes things easier. Just two of the characters may not have all the skills needed. It can be done, but not as easy as having all three to depend on. The pathway puzzles themselves are not any real brain busters, they are simple in looks...but harken back again to those platform jumping games where you have to get the character in just the right position to make it across or over an obstacle. The enemies are not as wide nor diverse as in other games. There are skeletons, and more skeletons and...well, more skeletons. So diverseness of enemies is not a strong point to the game. The sounds are well done with a musical score that fits a fantasy sword and sorcery tale of good vs evil. What lines there are for narration, and also the characters banter here and there is well done and seems to fit the characters well. The graphics are actually drop dead eye candy at it's best. That is saying a lot for a side scrolling game too. There are many times I beheld the foreground and back ground items though, and wished I could explore more of this world, or interact with things seen in the beautifully created art for this game world. 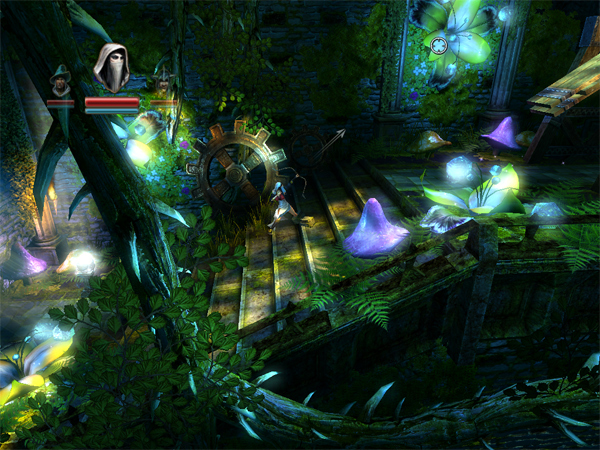 Trine is just one of those games that a casual gamer can pick up and play a little or a lot, also a heavy Impulse Gamer can feel good at having this hidden gem in their gaming collection. Getting through the levels does not require you to get all of the items on each level, and that's a good thing. So those hard to reach places do not have to necessarily be found, not conquered to progress.